Arrow explores the dynamic between Oliver and Adrian while taking major steps forward with the Russian flashback storyline. It’s still too early to say for sure but it’s possible that Adrian/Prometheus is the best villain this show has had. Slade Wilson aka Deathstroke currently holds that title for me but Adrian definitely has the potential to take that crown. The main reason for that is he has the unique ability to tear Oliver apart at the most basic level and represents a consequence of actions that Oliver didn’t give a second thought to. Slade was basically the same background but the way Adrian is being handled feels different and more visceral. This episode is off format in a sense because it barely has any interaction from anyone else on Team Arrow and gives a significant amount of time to the flashbacks. This is something that has been done before but it’s rare and it’s good to see Oliver given complete focus for an entire episode because it enhances the idea that everything happening at this point is because of him and choices that he has made. It has been well established that Adrian doesn’t want to kill Oliver because there’s no satisfaction in that. He wants to break him and take away everything that defines him. 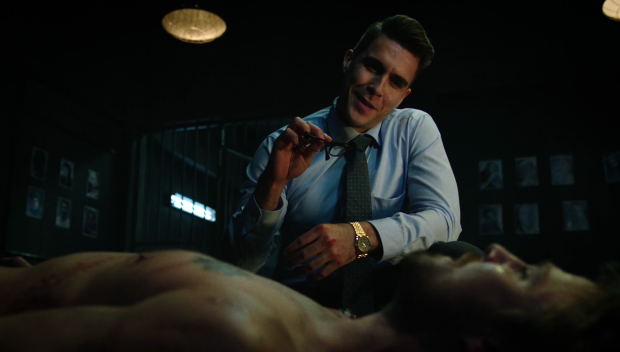 The torture he inflicts has absolutely nothing to do with killing him or even causing him bodily harm as all Adrian wants is for Oliver to admit his darkest secret. One that’s buried so deep that he is even ashamed to admit it to himself. Adrian’s entire mission is to prove a point and he’s willing to go to any length in order to do so. 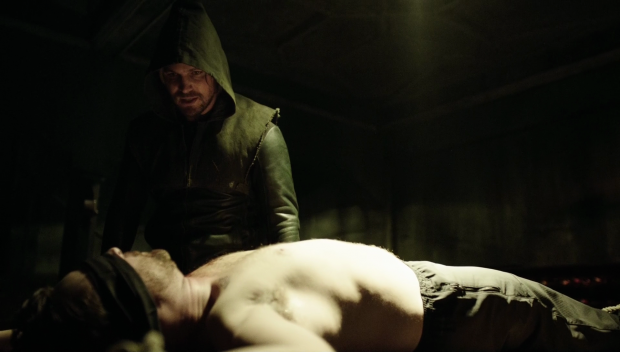 This could be one of the darkest episodes of Arrow yet for that reason alone as Adrian’s torturous campaign is brutal and uncompromising. What we essentially get as the plot of this episode is a deconstruction of Oliver Queen and what drives him to spend his nights as a vigilante. Ever since season 1 we have been told that Oliver was motivated to take on his vigilante identity to punish the privileged elite for their greed harming the city. This was accomplished by crossing names of a list held by his father. It was a clear mission even if he didn’t understand what was really going on behind it. Recent episodes have somewhat retconned this but we don’t quite realise to what extent until this episode. Adrian’s efforts are all to get Oliver to admit that he suited up because he enjoys killing and hiding behind another persona allowed him to do that without dealing with the guilt associated with it. What the show is now asking us to accept is that Oliver is two different people. The first is Oliver Queen who is basically a functional human being and the second is the Vigilante/Hood/Arrow/Green Arrow, a monster that facilitates Oliver Queen acting out his violent and murderous urges. When stacked up against what we have seen before then there are definitely issues with this reveal but I would say that it largely works because it seems to be something Oliver had refused to admit to himself before this point. If he wasn’t really aware of it then it’s not something that could have been hinted at before. The flashbacks support this by showing a more brutal Oliver than we have ever seen. Even in season 1 we never saw him skinning someone alive for “practice” and the way he mercilessly ploughs through Konstantin Kovar’s hired help shows absolutely no remorse for what he is doing. At this point in his life Oliver had taken the lessons that Talia taught him to heart and fully believes that this new persona is the perfect way to separate out his darker self. Anatoly sees through it for the nonsense that it is but the important thing for making this reveal work is that Oliver believes it and dismisses anyone that disagrees with him. When Oliver kills -not really but he doesn’t know that- Kovar there is no necessity to it. Every time he kills someone on the show be it in the flashbacks or in the present day it could be argued that he believed that it was something he had to do. Kovar was different because he was completely beaten and had no way of fighting back at that point so Oliver deciding to kill him was completely his own choice and it becomes clear in retrospect that he did so purely for enjoyment. It’s a brave direction to take the lead of the show in but it’s something that works because Stephen Amell is consistently able to carry this in his performance and the character work before this point is strong enough to suggest that there’s more to it than this. Adrian gets his confession which is fine because it’s a major defeat that Oliver needs to rise above. It’s clear that the confession is genuine because of Stephen Amell’s performance before, during and after he gives Adrian what he wants but there has to be more to it than that. The reason I say this is because of the antagonistic relationship between Oliver and Adrian. If Adrian is completely right about Oliver then there’s no way for him to be proven wrong which means that Oliver eventually beating him won’t be a satisfying resolution. I can see Oliver achieving a deeper victory than simply beating him in combat and it will be down to Oliver proving that he’s a better man that Adrian thinks he is. I think this will be achieved by his connection to those around him. It was established last week that he feels that having a team makes him a better person. Diggle joined his crusade early in season 1 and was able to stop him from going too far. Later in the season Felicity joined the team and acted as the conscience that Oliver was largely ignored so the slow process of regaining his humanity between season 1 and now has been heavily influenced by having people around him who encourage him to be a better man. Interestingly, Adrian’s assumption from last week comes true. He theorised that Oliver is one more loss away from completely breaking and this is proven when Adrian appears to kill Evelyn. Fair enough she betrayed him but Oliver still blames himself in some way for what happened to her family and caused her to be the way she is so he feels a measure of responsibility for that. Evelyn is also presented as a victim who needs Oliver to admit the truth so that she can survive. When he doesn’t do that and Adrian snaps her neck Oliver breaks and tells Adrian what he wants to hear. Evelyn is that final loss and Oliver is broken by it. I was really surprised when it turned out to be an act and that she was completely on board with Adrian’s plan. She really could be a better antagonist than we’ve seen and I imagine there’s still some story there to be told but it may be best left until next season. Again, Adrian proves to be true to his word and lets Oliver go when he admits the truth. Adrian doesn’t want to kill him because breaking him and defeating him in the most fundamental way is better. As far as he’s concerned Oliver should be allowed to live as a shell of his former self and judging by the end of this episode he has accomplished exactly that. Oliver goes back to his team a broken man who can barely stand up and tells them that he’s shutting down the operation. There’s nothing in it for him any more now that his true self has been revealed to him and there’s nothing to hide behind any more. This is a really intense way to end an episode and would have been the perfect way to end the season. With a few episodes left I can only speculate as to what the show will throw at us next. As for Adrian there’s a tragedy to the character and his persistent vendetta against Oliver. He has been so consumed by this that he is unable to function. This causes him to murder his wife because she represents a weakness for him and devote all of his energy to tearing Oliver apart. It’s very sad and it’s clear that the character is beyond redemption because of how far he has let himself take things. His obsession with Oliver extends so far that his name is carefully chosen. He sees Oliver as someone who thinks of himself as a God because he plays judge, jury and executioner so Adrian sees himself as the one who challenges that. The reference doesn’t quite work as Prometheus was a figure who brought fire to mankind which gave them their own agency. So far, Adrian hasn’t really lived up to that in any metaphoric way so it feels a little underdone. Maybe there will be greater significance later that we don’t know about. I’ve mentioned them above but the flashbacks were really well done this week. The expanded screen time allowed the story more time to breathe and it allowed us to see the development of Oliver’s murderous persona in a way that makes his confession more impactful. It works because we see him become that and Anatoly is able to comment on it. The flashbacks are at their best when they compliment the present day story. 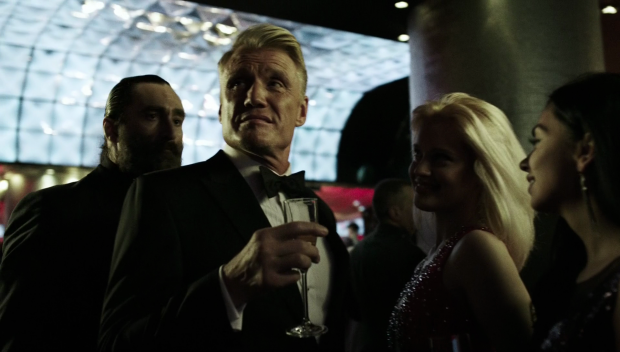 Kovar is a great antagonist as well and Dolph Lundgren brings the right degree of elegance combined with savagery. He is definitely a formidable opponent which makes the action sequences really exciting to watch. With any luck his survival means that he can turn up to be a present day threat for Oliver at some point though I’d hate to see Adrian turn out to be working for someone as he is great as a villain who has his own agency. I didn’t even mention the Malcolm Merlyn cameo which felt a little bit like fan service but was also nice to see. It’s comical to think that Oliver was so close to meeting him back at that point but it doesn’t really add anything other than some fun interactions between Malcolm and Kovar who casually introduces himself as a gangster. An excellent and brutally intense episode that offers an interesting deconstruction of Oliver as a character. 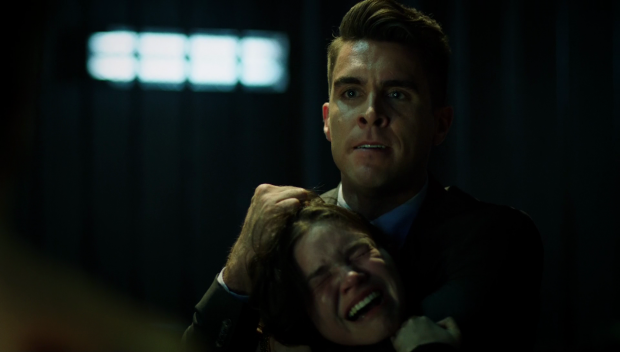 Adrian remains consistent in his desire to break Oliver rather than kill him which makes him unique and interesting as far as this show goes. Framing the entire episode around getting Oliver to admit that he enjoys killing and that’s the entire reason for him taking on the alternate persona is a great idea because it allows for some excellent interactions and powerful acting. The reveal that Oliver enjoys killing is something of a retcon but making it something that he lied to himself about makes it work. I suspect there’s more to it as there should be a satisfying conclusion in the form of proving Adrian wrong. Using Evelyn as a way to get him to break worked brilliantly especially when it was revealed that she was in on the plan and only pretended to be killed. This proves Adrian’s assumption that Oliver was one loss away from breaking right and Oliver returning to his team a broken man intent on shutting down their operation was a shocking ending. The flashbacks were back on form this week with a close thematic and narrative link to the present day story that enhanced Oliver’s confession. Kovar is a great villain with his elegant brutality and imposing physical presence that makes action sequences involving him really compelling viewing. I’m hopeful that his survival means that he will return in the present at some point though hopefully not until next season as Adrian is more than enough villain to go around.